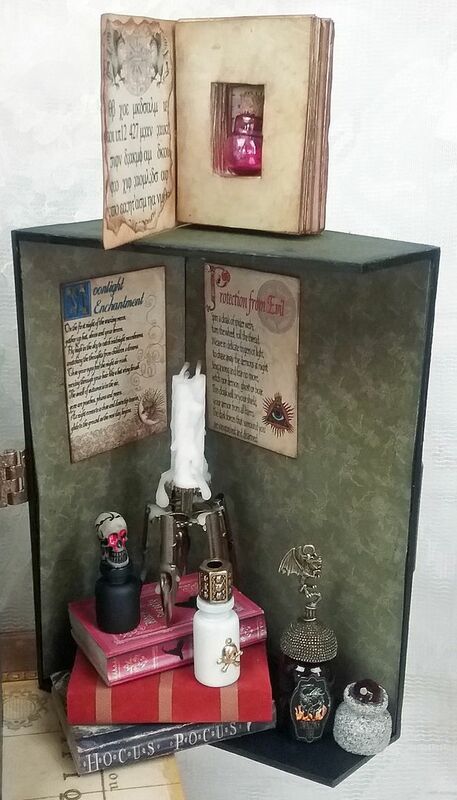 Halloween must be just around the corner because I’ve made another apothecary. 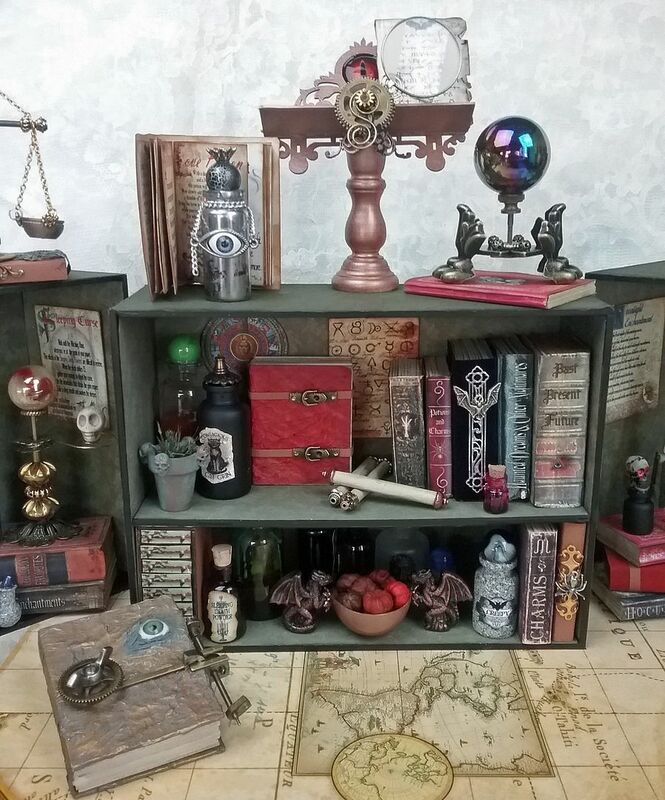 This one is a mini version packed with books, bottles, steampunk style goodies and more. If I haven’t tempted you before with my apothecaries, maybe this time I will! 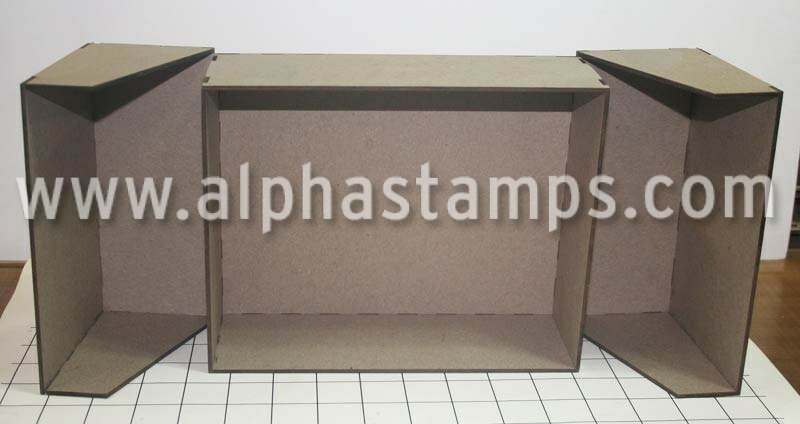 The construction of the cabinet is made easy by using a split front chipboard box kit. It’s simple to assemble and decorate so you can spend all your time making cool things for the inside. 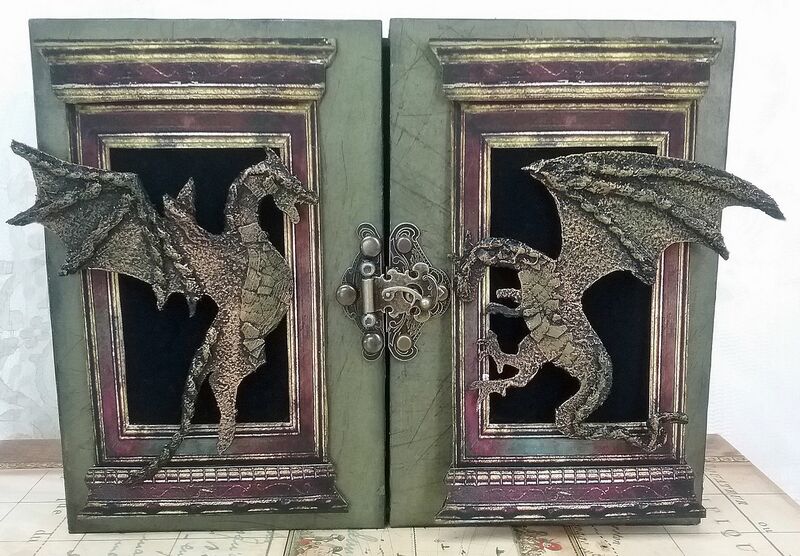 Guarding the front of the apothecary are two battling dragons made from chipboard. In the video tutorial, I’ll show you how to transform them into the textured pieces that you see in the picture above. 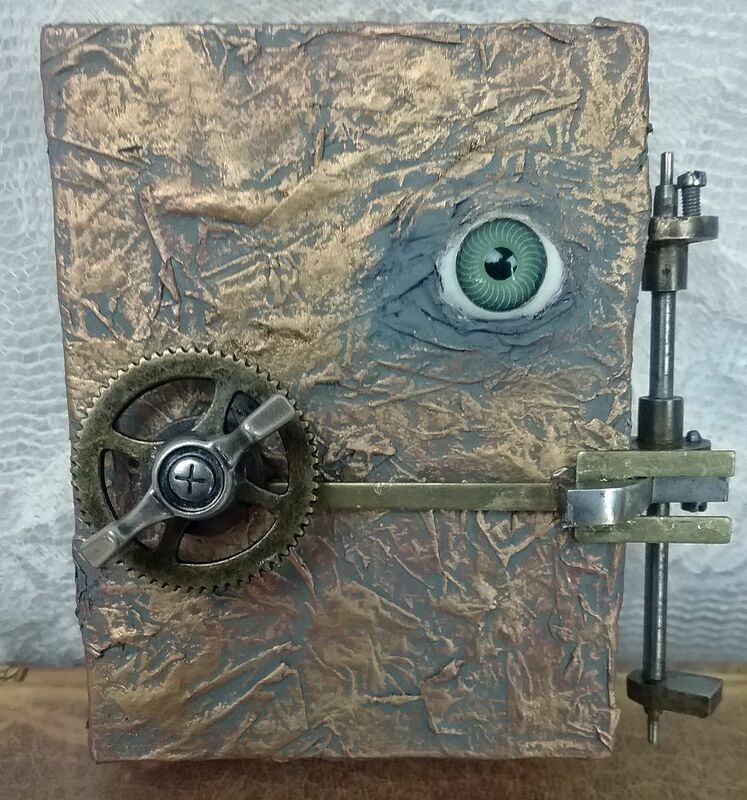 Just like the Mad Scientist Laboratory, this project has a few mechanical steampunkish pieces. 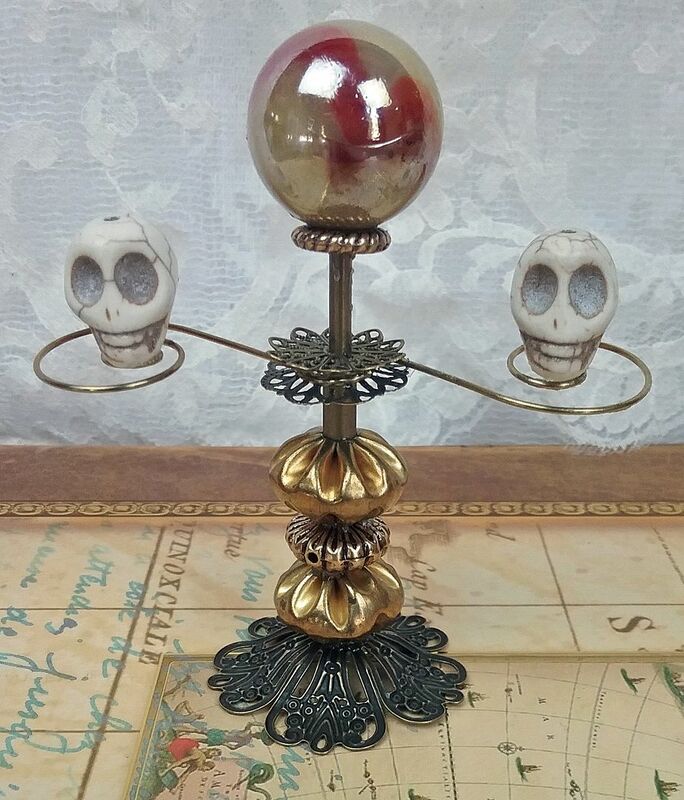 There is a bookstand, scale, candle holder and a couple of crystal balls. 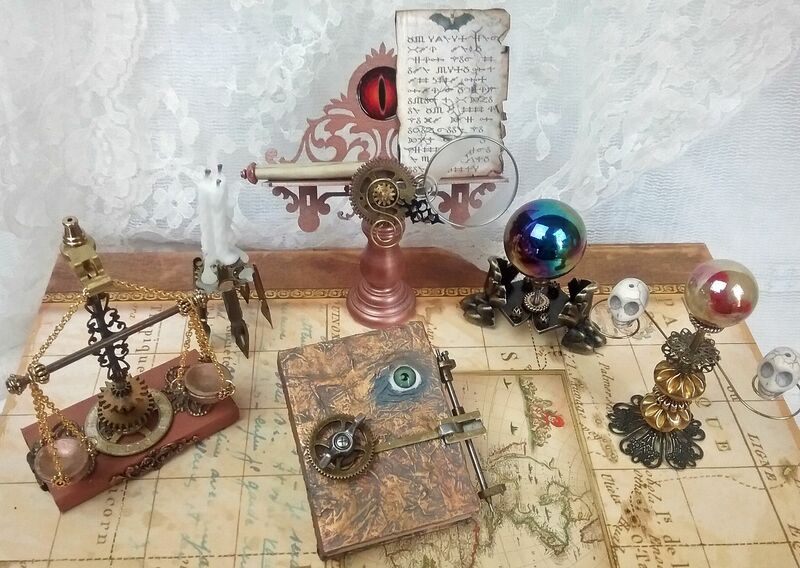 With a library filled with magical books, you’ll need a special bookstand with a mechanical gizmo that lets you decipher hidden text and tricky spells. In the video I’ll show you various bookmaking techniques, using my new collage sheet images and other materials. I’ve written a series of spells, enchantments, and potions to incorporate into small handmade books. Well except for the “Witches Brew” by Shakespeare. Some are dark and some are light, something for everyone. I think one of my favorites is the “Protection from Evil” spell. turn the wheel, roll the thread. to chase away the demons at night. witch nor demon, ghost or boar. your armor from all harm. 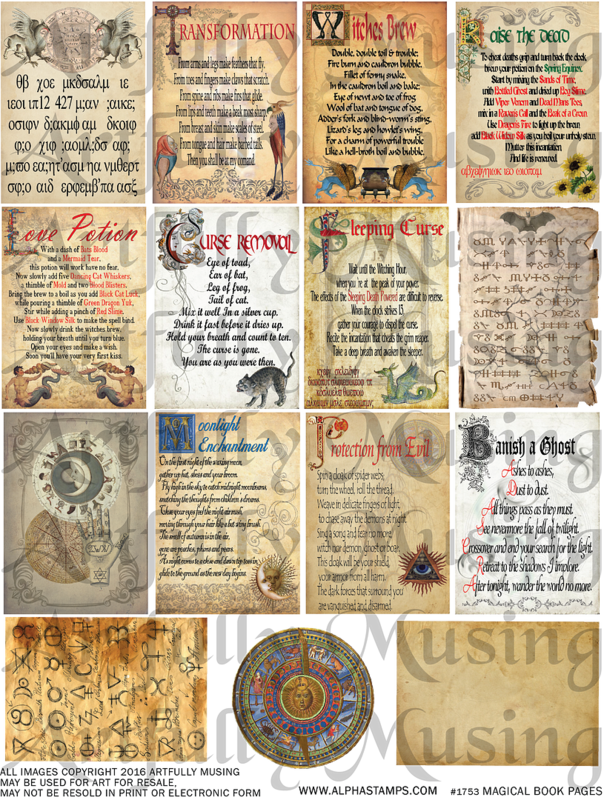 You can also find all these spells in a large 7” x 5” version for making full-sized spell books. If you try any of these spells and they work, let me know! 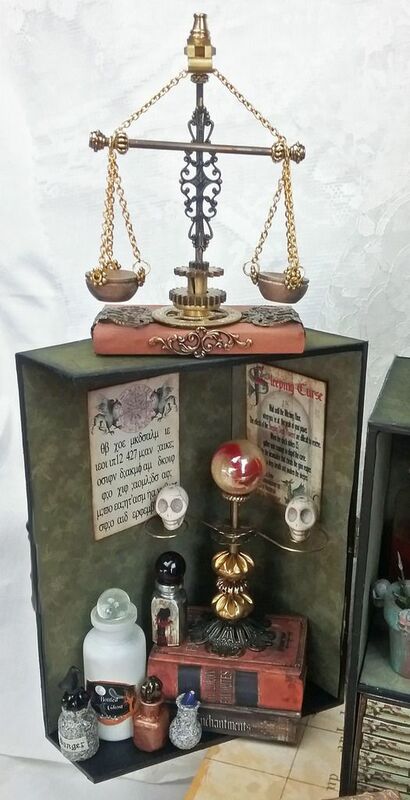 Indispensable to any apothecary is a scale to weigh potion ingredients, another one of the items I cover in the video. 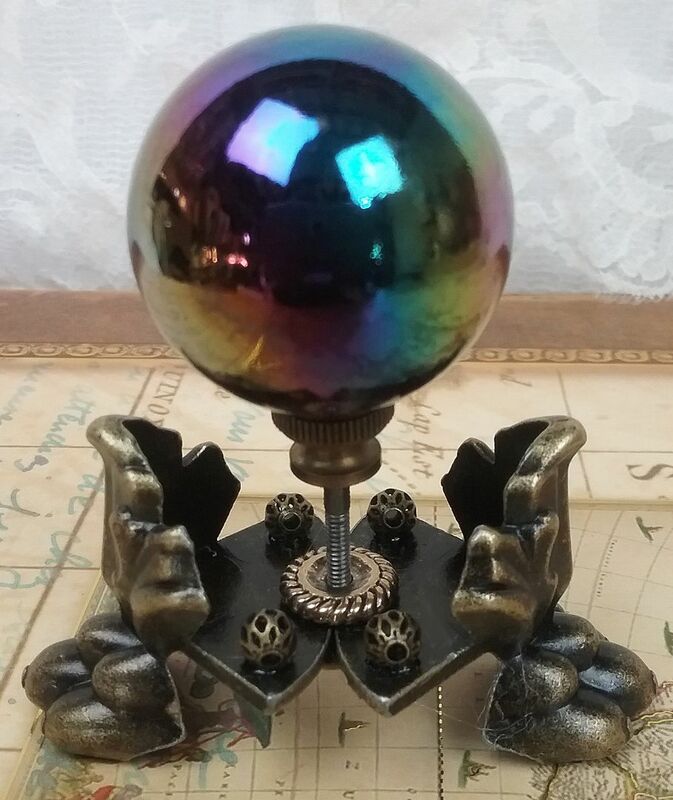 If divination is your thing, this apothecary sports two crystal balls. I wonder what’s in that bottle that's tucked into a book. A book’s got to be pretty dangerous to need locking up. You might recognize it as the cover is a mini version similar to my Book Apothecary from last year. Of course, you can’t have an apothecary without bottles. In the video, I’ll the various types of spray paints I used to color and texture the bottles. Checkout the bowl held by two dragons. Guess what, it’s half of a ping-pong ball. Want to start your own mini magical library? Then my new Magical Books & Magical Book Pages collage sheets and digital image sets are a great start. 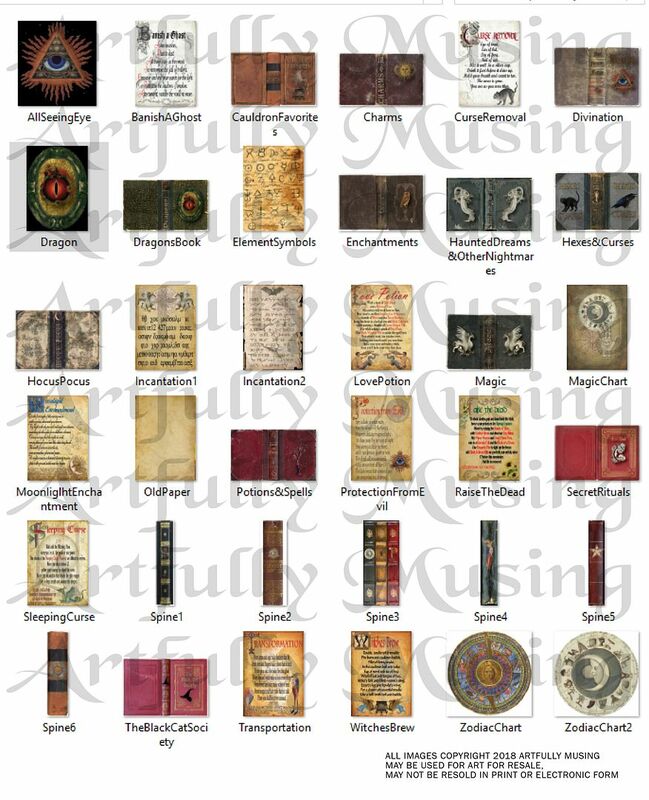 If you're into larger books, there is a digital image set filled with 7”x 5”magical book pages. You'll find the details below. These two sheets are filled with all kinds of magic book covers and spines. Mini book covers are a great way to create your own mini magic library. 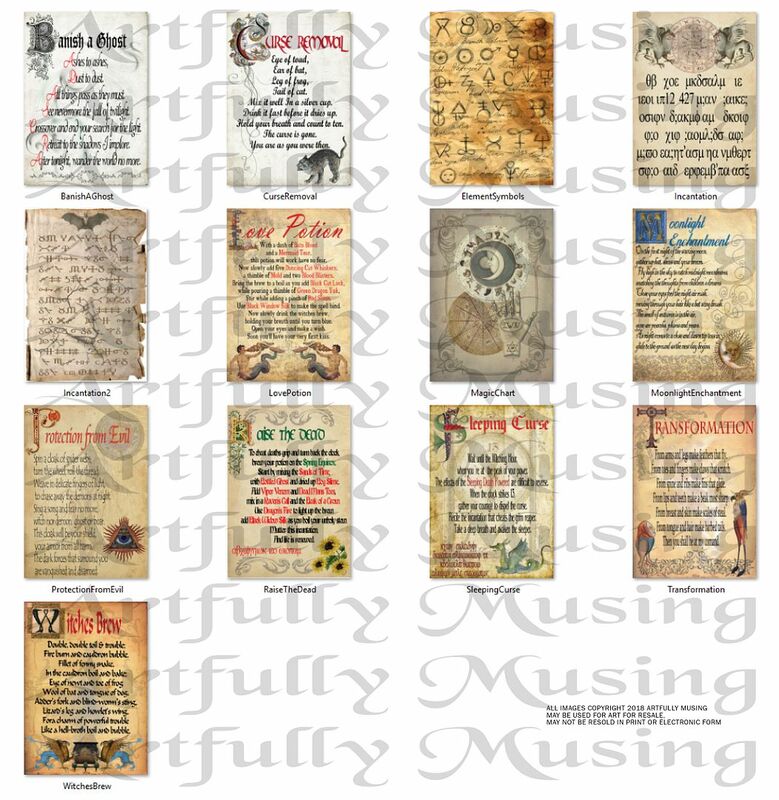 This collage sheet contains 13 pages of spells, potions & enchantments plus more. 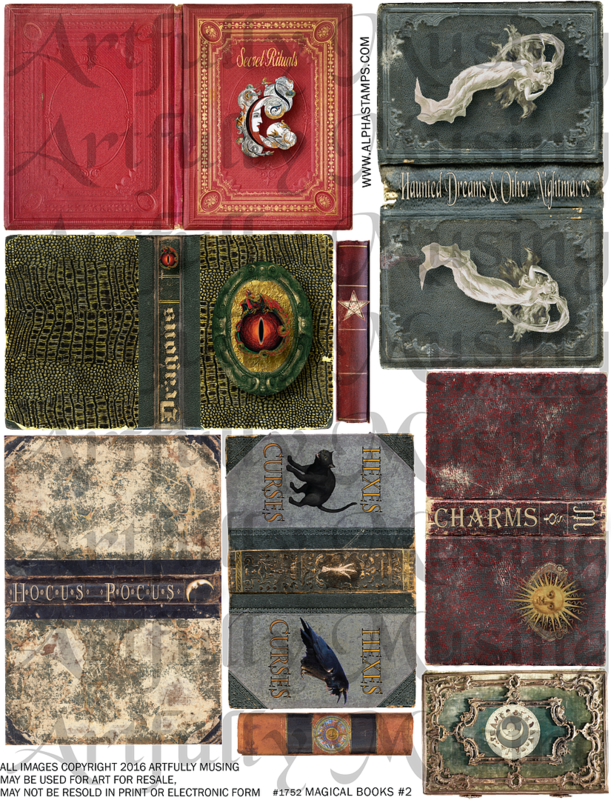 These pages are a mini version of the Magic Book Pages Large Version Digital Image set and are sized to fit the books in the Magic Book Covers Collage Sheet. 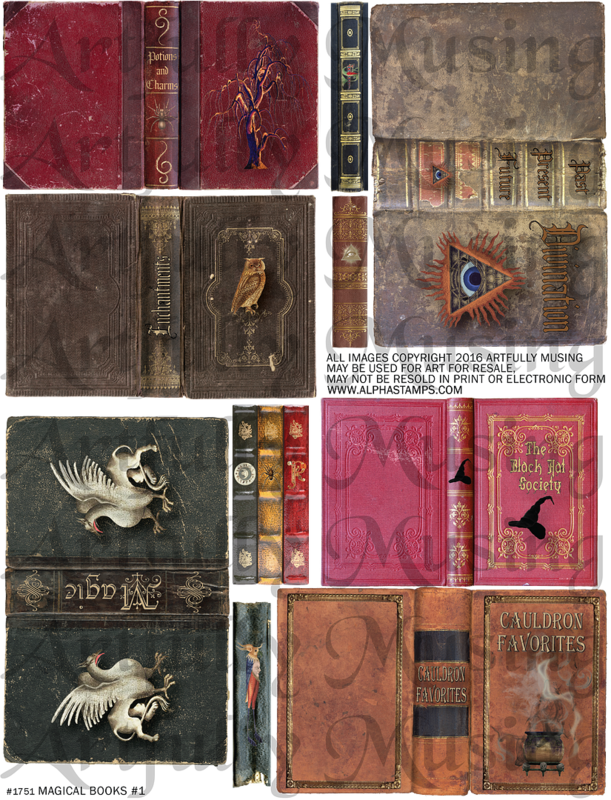 This set includes 13 pages sized 7” x 5” that are perfect for creating a book of magic. 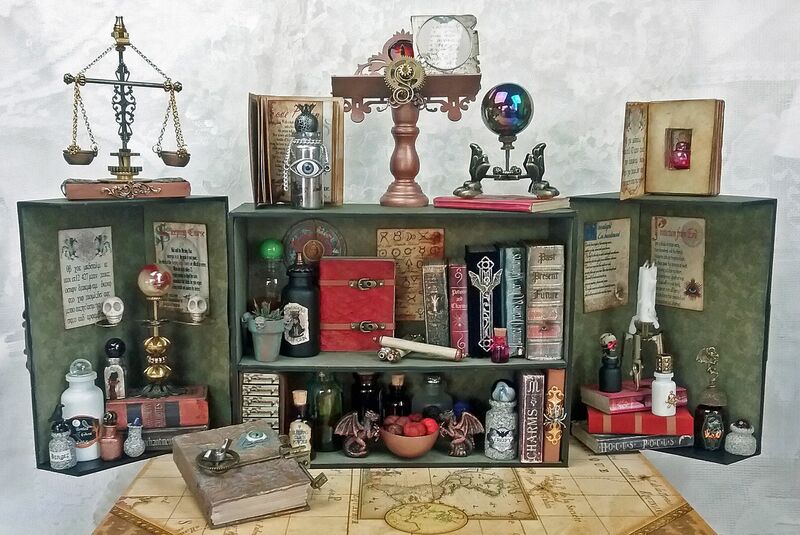 The pages contain spells, incantations, enchantments, and potions. 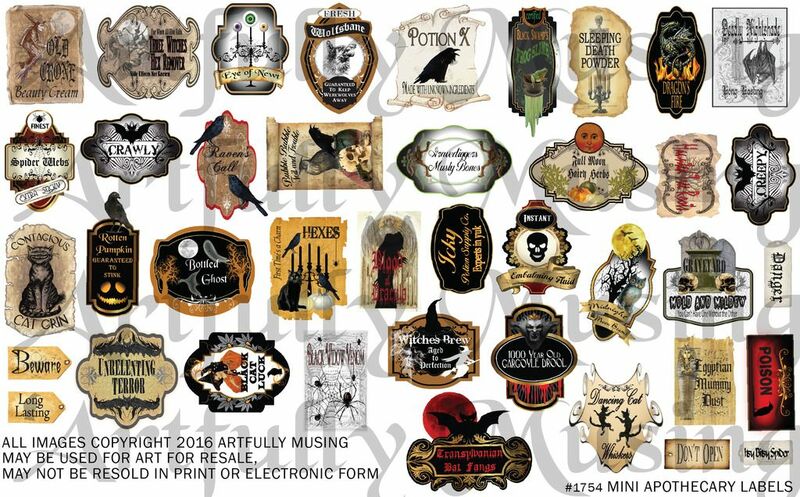 This sheet contains 40 unique mini apothecary bottle labels. 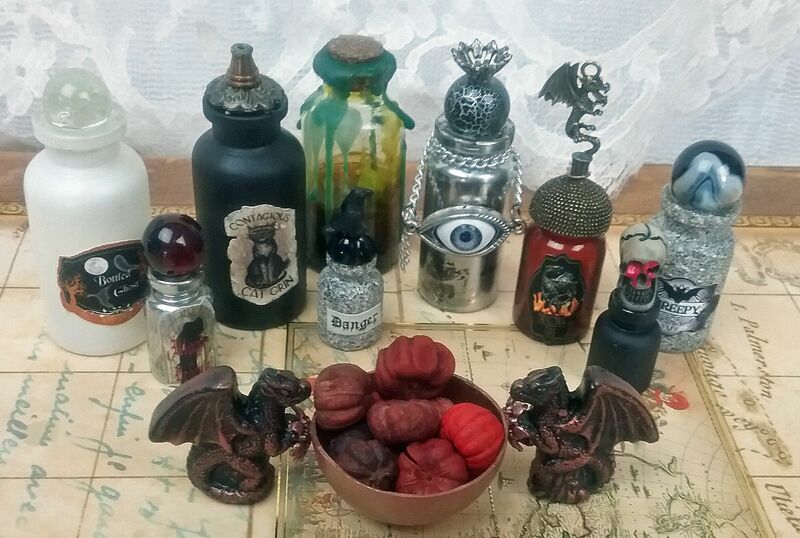 They are a miniature version for my Pretty Potions and Poisons Apothecary labels. 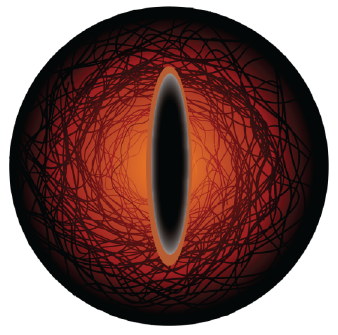 This is the eye graphic I used for the book stand. You may already have this as I have used it in other projects. This version is sized to fit the book stand in this project. 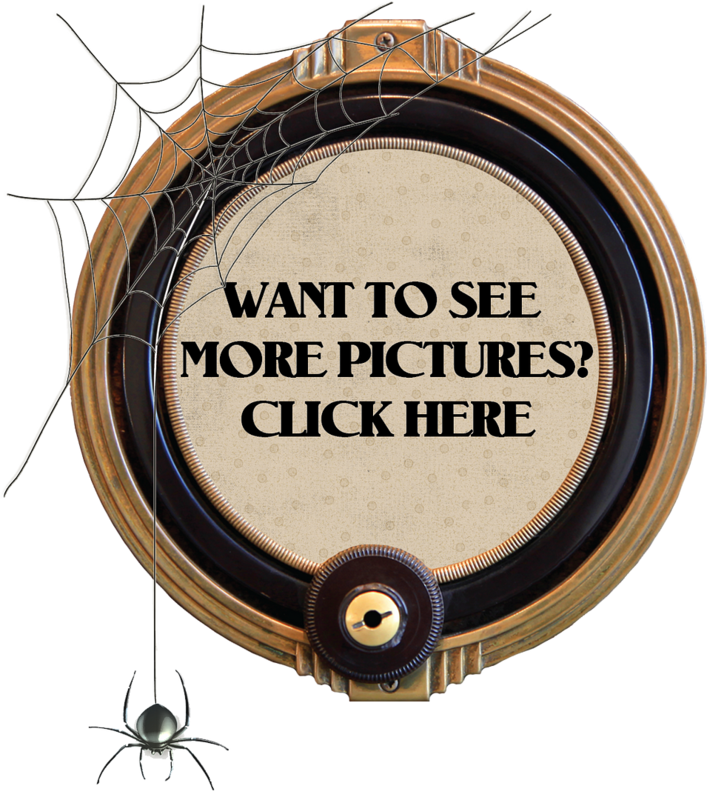 Feel free to download the image and use it in your art. To download an image, just click on it and a menu will pop up. Select the "Save as" menu option and select where you want it saved on your computer. It's always a delight to see your wonderful ideas and creations, brilliant Laura!!!! Your imagination is amazing, but I love it! I love the scale, so pretty! I've said it many times before, but I'll say it again, YOU are amazing! Your projects are always fascinating and wonderful. Thanks also for the video! Laura you are so generous with your information and so talented! As soon as I saw your apothecary I bought the mini book digital downloads (anxious to get them)! Thanks again! Absolutely amazing Laura! !You are so clever! !